"Yes, this is the Crime Club. I'm the librarian." Take a seat. Get comfortable. And get set for a murderously entertaining evening at the Crime Club! 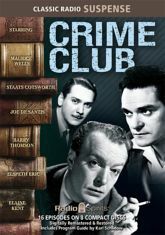 Based on the famous series of mystery novels, here are sixteen cold-blooded excursions into the criminal mind, as originally broadcast in 1946-47! These digitally restored and remastered episodes feature the voices of Maurice Wells, Brad Barker, Staats Cotsworth, Joe De Santis, Raymond Edward Johnson, Barry Thomson, and more.